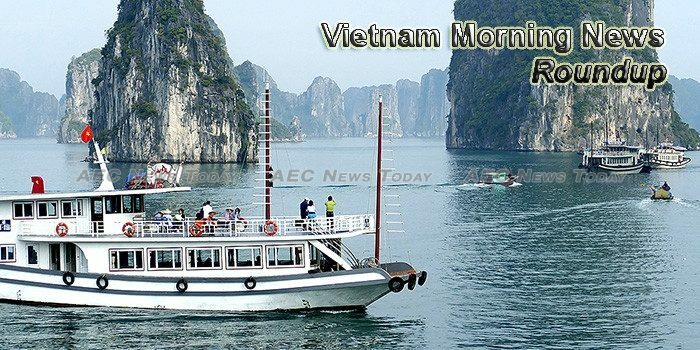 Vietnam hopes for New Zealand’s cooperation and support in training personnel and enhancing capacity for judicial officials to meet international integration requirements, said Deputy Minister of Justice Le Tien Chau. Foreign Minister Phạm Bình Minh and Angolan Minister of External Relations Georges Rebelo Pinto Chikoti agreed to continue seeking measures to strengthen ties in prioritised areas and expand cooperation in promising fields including agriculture, health care, oil and gas, and telecommunications. Controlling public debt and ensuring stable Budget revenues will be priority tasks for the Government this year, the Prime Minister has directed. Vietnam is an intriguing market undergoing significant change, and its stock market has been a strong performer. It is one of the largest positions within our T Rowe Price Frontier Markets strategy, and we have been overweight since mid-2014. Chrey Thom Bridge connecting the southern province of An Giang in Vietnam and Cambodia’s Kandal Province was inaugurated on Monday. Vietnam and Thailand convened their 11th bilateral conference on drug prevention and control cooperation in the central coastal city of Da Nang on April 24. Cambodia on Tuesday rolled out its red carpet for Vietnamese Prime Minister Nguyen Xuan Phuc on his official visit to the kingdom to boost bilateral ties and cooperation. Prime Minister Hun Sen yesterday accused “some people” of trying to instigate conflict, and even war, between the country and its neighbours, while personally claiming responsibility for peace and regional cooperation in a thinly veiled swipe at the opposition’s past use of anti-Vietnamese rhetoric. Prime Minister Hun Sen on Tuesday signed off on cooperation deals with his Vietnamese counterpart, including a new expressway linking the two countries. Unseasonable rain earlier this year has damaged 40,300ha of crops in the southern province of Dong Nai, according to its Department of Agriculture and Development. When Gen. Maxwell Taylor returned from South Vietnam in 1961, he proposed a seemingly simple way to stem the rising Communist insurgency: an impenetrable barrier that would cut off the supply of people and arms coming from the North. Party General Secretary Nguyễn Phú Trọng wants Việt Nam and the Republic of Korea (RoK) to ratchet up the efficient co-operation between political parties, governments, parliaments, and localities to achieve a more productive strategic co-operative partnership. National Assembly Chairwoman Nguyễn Thị Kim Ngân hosted separate receptions in Hà Nội yesterday for Australian and New Zealand Ambassadors to Việt Nam, Craig Chittick and Wendy Matthews. Vietnamese Prime Minister Nguyen Xuan Phuc and his Cambodian counterpart Samdech Techo Hun Sen agreed on various measures to bolster the countries’ multi-faceted relations at their talks in Phnom Penh on April 25. THE ROCKY ISLETS resolved through the haze at the bow, and the captain slowed the boat so we could take it all in. Some of the islands stood densely packed like monks in conclave, others lone and admonitory like the fins of monstrous sea creatures. Specialist adventure tour operator Rove has now expanded into Vietnam, bringing its countries of operation up to a total of eight, in addition to Thailand, Sri Lanka, Mongolia, Indonesia, Cambodia, Myanmar and Laos.